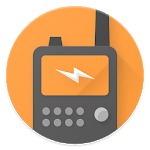 Listen to live audio from over 7,000 fire and police scanners, weather radios, amateur radio repeaters, air traffic and marine radios from around the world. 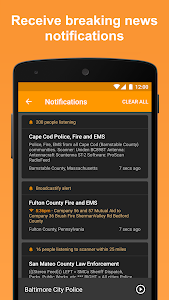 Turn on notifications to receive alerts anytime a scanner has more than 3500 listeners (find out about major events as they're breaking). 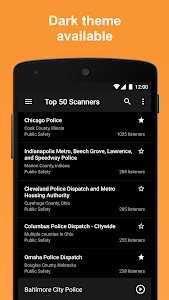 • View scanners located nearest you. 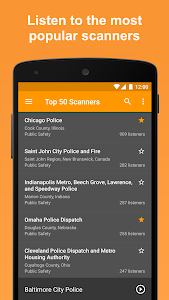 • View the top 50 scanners that have the most listeners. • View list of scanners added most recently (new scanners are being added all the time). 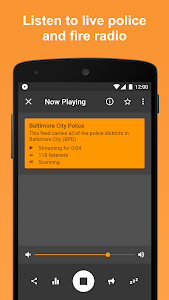 • Add scanners you listen to the most to your Favorites for quick access. • Browse the directory by location or genre (public safety, air traffic, railroad, marine, etc). • Turn on notifications to be notified when major events are happening (details below). • Add Scanner Radio widgets and shortcuts to your home screen for quick access. • ...any scanner in the directory has more than 3500 listeners (configurable). • ...a scanner within a certain distance of your location has more than a certain number of listeners. • ...a specific scanner has more than a certain number of listeners. 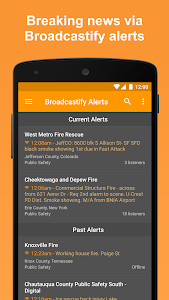 • ...a Broadcastify alert is posted for one of your favorites. • ...a scanner within a certain distance from you is added to the directory. • Access to all 6 theme colors. • Push notifications sent within 5 minutes (vs within 15 minutes). 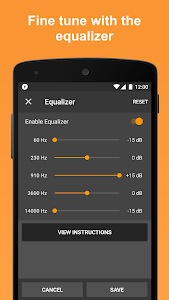 • Ability to record the audio. • The play button at the top of the directory screens and on the widgets can be used to start listening without having to go to the player screen. The audio you're able to hear is provided by volunteers (and, in many cases, police and fire departments themselves) for Broadcastify.com and a few other sites using real police scanners and is the same audio you would hear using your own police scanner. 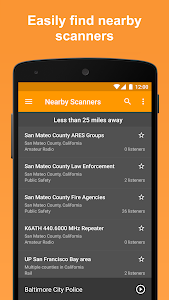 • The "Location" permission is required so that the app can determine what scanners are located in your area when you select "Nearby Scanners". When you select "Nearby Scanners" the app first attempts to determine your location via the network, if that fails the app then tries to determine your location via GPS. • The "Photos/Media/Files" / "modify or delete the contents of your USB storage" permission is required in order to allow you to record the audio you're hearing and be able to save it to a location that you can access from your computer (requires Scanner Radio Pro to be installed or for you to be using Scanner Radio Pro). • Added a notice which will be displayed if the user attempts to enable alert notifications but has Android configured to block them. • Fixed a couple of widget-related bugs. • Fixed a couple of bugs related to sharing and deleting of recordings. • Fixed a few other miscellaneous bugs. 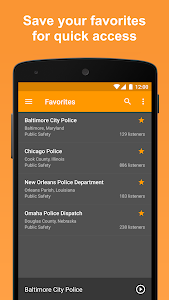 Similar to "Scanner Radio - Fire and Police Scanner"